Jiu Jitsu is a Martial Art that has been underrated for many decades. The traditional martial art practitioners had a hard time accepting the strength of Jiu Jitsu because its focus was the place that every fighter dreaded to be – on the ground. Through clever usage of leavers and conservation of energy the Jiu Jitsu practitioner has a huge advantage when the fight goes to the ground. A Jiu Jitsu practitioner can often defeat opponents who are much stronger and bigger if they have not had ground experience. 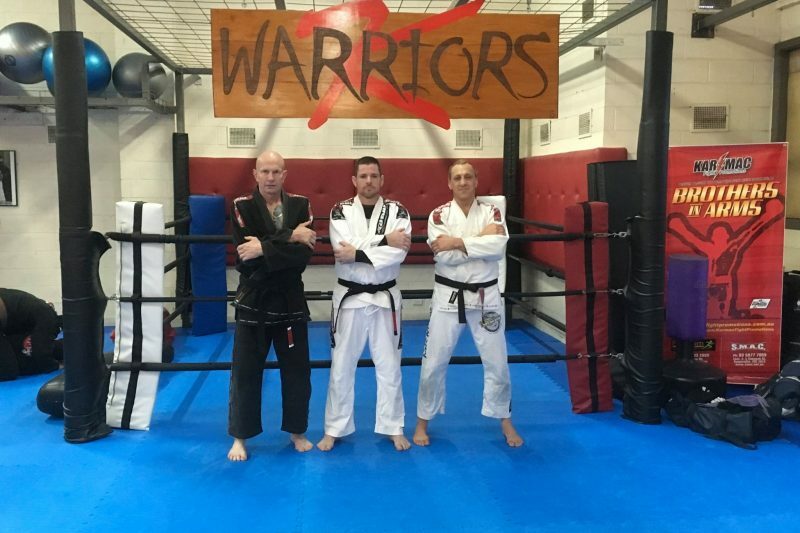 Nick Wright trains most of the Brazilian Jiu Jitsu classes and caries with him a legacy of real world military experience where his life literally depended on his fighting skills. He holds a black belt in Brazilian Jiu Jitsu and is well respected in the Jiu Jitsu community and has met and trained with some of the best in the world. When you train at Billy Manne Martial Arts you will progressively learn the art of Jiu Jitsu. Within a short period of time you will experience your first rolling session (controlled ground fighting) as we believe that its critical when learning to ground fight you engage in frequent rolling. Jiu Jitsu is a fitness unlike many others. If you push too hard on your first sessions you might end up a bit sore. Jiu Jitsu is an acquired fitness which takes time to develop the necessary muscle strength and flexibility. The fitness of Jiu Jitsu is different compared to other activities. As human beings we are adapted to standing and sitting – we rarely utilise the muscle groups that Jiu Jitsu demands. Jiu Jitsu provides you with the ability to control and finish the fight on the ground. Jiu Jitsu provides you with the tools to dominate in this situation, often beating larger and stronger opponents. Jiu Jitsu is a strategic Martial Art. The best way to beat a submission is to not allow that position to occur in the first place. Jiu Jitsu is intellectually and physically challenging. If you wish to compete – we attend Jiu Jitsu competitions where you can test yourself against other opponents as well. But this is not mandatory of course. Jiu Jitsu has many long term benefits. You will discover that your body will grow to like BJJ and if you ever have a break from the sport, many people report a longing to get back to regular training and rolling. Its important to know that we have many Jiu Jitsu students in Carrum, Chelsea Heights, Frankston South, Mount Eliza, Langwarrin, Karingal, Patterson Lakes & Somerville. We also have many Brazilian Jiu Jitsu students scattered throughout the Mornington Peninsula. Out of class it helps tremendously to connect with other students and practice basic moves.